Noh is an art form in which the division of the roles is very clearly defined. The tachi kata are the three main roles in charge of song and dance: shite, waki and kyōgen. The hayashi are the musicians at the back of the stage and they are divided into four instrument groups: fue (flute), kotsuzumi (shoulder drum), ōtsuzumi (hip drum), and taiko (stick drum). Furthermore, each of the aforementioned groups is also broken up into a number of different ryū or schools. Up until the Edo Period waki, hayashi, and kyōgen were known as san-yaku and each shite school had its own group of these specialist to work with. From the Meiji Restoration this system began to fall apart and today these san-yaku are independent from the shite school and split into seven different disciplines and twenty-four different schools. Each school in the different disciplines of shite, waki and kyōgen has developed its own style of dance and delivering prose and poetry, while each school in the different instrument disciplines has developed its own patterns and notation. Basically shite are no longer in control of the other players that accompany them in their performances. Also members of the other disciplines are free to form alliances with other theatres as they like. 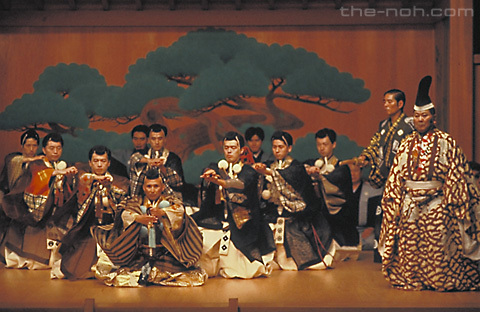 Along with the assuming the main role in a noh, the shite are responsible for fulfilling the roles of the chorus, as well as shite-tsure, and kokata should that particular noh require them. In addition, at the back of the stage, two kōken (stage attendants) sit to help with costume changes, retrieve props and feed the shite lines should he forget. The koken are also shite-kata from the same school as the main performer. As the shite performers have considerably more responsibilities, it makes sense that compared to the waki, kyōgen and hayashi, their numbers are far greater. The five current shite schools are Kanze, Hōsho, Konparu, Kongō and Kita, of which the first four were founded in the Muromachi period and were known as the Yamato Sarugaku Yoza. The Kanze school, is named after a childhood name of its founder Kannami. Kannami’s son, Zeami was the second leader of the school, who was then succeeded by his nephew Onnami as his son, Motomasa, died young. During the Muromachi period, only the Kanze school received protection from the shōgunate. Then, during the Edo period, the Kanze school assumed the head of the four schools designated by the Tokugawa Shōgunate. The Kanze school had formed a relationship with the Tokugawa's back before they came to power and were living in Hamamatsu Castle, thereby securing their preferred status in the noh world. Another cause for their prosperity was the popularity of their singing style even from the Muromachi period. To this day, the Kanze school holds the most influence among the noh schools and performs with grace, and characteristic sensitivity. Founded by Kannami's eldest brother Hōsho Dayu, the Hōsho School originated from the Tobi-za, one of the four Yamato Sarugaku Yoza. The group eventually named themselves after their main performer Hōsho Dayu. The fifth shōgun of the Tokugawa period was particularly taken by the Hōsho style and was their top patron. They were also the favorite troupe in Kagahan (current Ishikawa area) and because of this, they still have a strong influence in the noh of modern day Tokyo as well as Hokuriku area. In addition, the 11th shōgun Ienari was very fond of the Hōsho School. The Hōsho style is described as dignified and the “Hōsho Singing” is said to be sensitive and refined. Ancestral links between the Komparu School and Hatano Kawakatsu can be made. Among the three shimogakari schools (Komparu, Kongō and Kita. The Kanze and Hōsho schools are known as the uegakari schools,) The Komparu school has the longest lineage and therefore the most notable social status. The roots of this school are in Nara and consequently they have a strong relationship with Kofukuji Temple as well as the Kasuga Palace. The name of the schools founder, Komparu Gonnokami, can be found in the Sarugaku Dangi (Discussions on Sarugaku). Other notable members of this school are Zeami’s son-in-law Komparu Zenchiku and Zenchiku’s grandson Zenpō, who are remembered not only for their performance but for their theoretical as well as their dramatic writing. Zenchiku’s masterpieces, Bashō and Teika are well known for their markedly different use of yūgen (mysterious beauty) as compared to the works of noh master Zeami. When the shōgunate was under the control of Hideyoshi Toyotomi and his nephew Hidetsugu, the Komparu school prospered and flourished, but when the Edo period began, both the Kanze and Kita schools became more popular as the Komparu school fell out of favor. Today Komparu school activity centers around Tokyo and Nara. Their performance can be characterized as having residual grandiosity from the time-honored traditions. Their singing style is thought of as possessing a free, open-hearted sense to it. The Kongō School seems to have been formed out of the Sakado-za sarugaku group which was connected to Horyu Temple. From the Muromachi period to the Edo period, it was not held in high favor. In 1576 7th master Kongō Ujimasa died thereby bringing an end to the traditional family line of sarugaku. Towards the end of the Edo period through the Meiji period, the Kongō school produced some unusually strong talents such as Kongō Tadaichi (who developed the idea for the 1000 string performance of Tsuchigumo). Then in 1937 (Showa period year 11) with the death of the 23rd generation Kongō master Kongō Ukyo, the Saka-do Kongō lineage came to an end. Today disciples from the Nomura family line of Kongō performers center their activity in Kyoto and Tokyo. Today the “Kongō Dance” is known for its magnificent grace. Starting at the beginning of the Edo period, the Kita school was founded by Shichidayū Chōnō(or Osayoshi). Chōnō started as a shite in the Kongō school and then in the Genna period (1615-1624) he set out independently and thus began the Kita school. Even though the heads of the Tokugawa shōgunate Ieyasu and his son Hidetada were patrons of the Kita school, it was eclipsed in popularity by the Kanze and Hōsho schools. These days, their popularity stems from the vestiges of their firmly planted roots. Their performance style can be characterized as “samurai-like” with a thick layer of spiritualism, full, simple and vigorous.